No matter where you live or what type of business you run, whether it’s a golf course, park, or restaurant, landscape lighting can create a welcoming environment, protect guests, and help put a focal point on certain areas. Even though lighting is a sort of finishing touch on many designs, it plays an essential role in the overall feel of the space. So you probably know that you should and want to include some type of lighting in your space, but where do you start? What type of lighting do you choose? 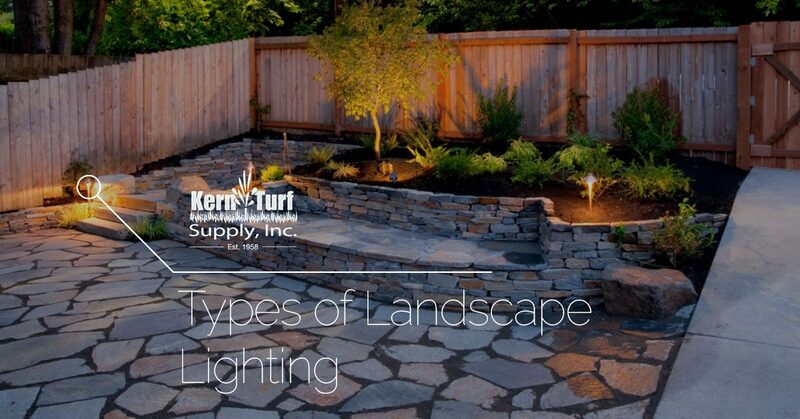 The landscape supply experts at Kern Turf Supply can help you out. We have a range of products that are easy to install and can help enhance your overall landscape design. Here are some of the most popular styles that you can incorporate into your design. Get in touch with our team today to learn more about the landscape supplies we offer. 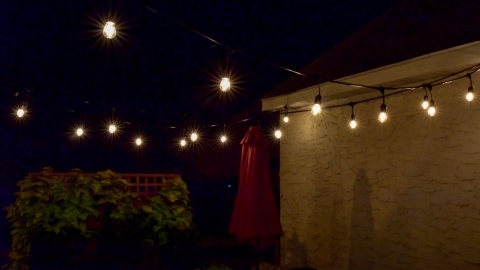 If it’s in your backyard or restaurant’s back patio, deck lights give off enough light for anyone in the area to feel comfortable, safe, and warm. Deck lights can be installed below any built-in seating, strung from the railing, on the vertical edge of stairs, or can be strung above for overhead lighting to ensure that everyone is safe when walking around, and can help illuminate the surrounding spaces. This type of landscape lighting isn’t necessarily used to enhance the environment, but more so for people to see their surroundings the best. The light creates a “flood” of light that spreads throughout the space to brighten up any corners. They are also commonly used when security is an issue. In this case, consider installing sensors to turn the lights on automatically when there is any motion. These can be used throughout the landscape to create pockets of light that give the space a soft look. When selecting hanging lights, consider all of the options, including lanterns, sconces, smaller light bulbs attached to a string, pendants, or even chandeliers. These are great when you have a seating area within the design. Just make sure to look that the lights are suited for the outdoors, as they could otherwise be dangerous. A majority of landscape designs have some sort of pathway, whether it’s leading to a bench or the exit. Give guests the best experience possible, especially when there are stairs involved, with pathway lighting that is bright enough to illuminate the path, but not so bright that it’s overpowering and uncomfortable. Choose pieces that fit your style and personality, but also match existing design elements. When you’re standing in the doorway, looking out at the landscape, the lighting may be set up perfectly to see each corner and every feature of the space. But on the other end, looking toward the doorway from the back of the landscape, you could be blinded by lights. Consider the placement of the lights, the direction they’re facing, and the voltage. These factors can make or break the entire scene. If you’re planning your landscape, get the best landscape supplies and more from Kern Turf Supply in Bakersfield. From drip irrigation systems to BBQs to landscape lighting, we’re your number one source for landscape supplies that create beautiful and efficient spaces.